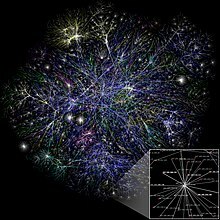 The word telecommunication is a compound of the Greek prefix tele (τηλε), meaning distant, far off, or afar, and the Latin communicare, meaning to share. Its modern use is adapted from the French, because its written use was recorded in 1904 by the French engineer and novelist Édouard Estaunié. Communication was first used as an English word in the late 14th century. It comes from Old French comunicacion (14c., Modern French communication), from Latin communicationem (nominative communicatio), noun of action from past participle stem of communicare "to share, divide out; communicate, impart, inform; join, unite, participate in", literally "to make common", from communis". On 25 July 1837 the first commercial electrical telegraph was demonstrated by English inventor Sir William Fothergill Cooke, and English scientist Sir Charles Wheatstone. Both inventors viewed their device as "an improvement to the [existing] electromagnetic telegraph" not as a new device. The conventional telephone was invented independently by Alexander Bell and Elisha Gray in 1876. Antonio Meucci invented the first device that allowed the electrical transmission of voice over a line in 1849. However Meucci's device was of little practical value because it relied upon the electrophonic effect and thus required users to place the receiver in their mouth to "hear" what was being said. The first commercial telephone services were set-up in 1878 and 1879 on both sides of the Atlantic in the cities of New Haven and London. The shaping of a signal to convey information is known as modulation. Modulation can be used to represent a digital message as an analog waveform. This is commonly called "keying"—a term derived from the older use of Morse Code in telecommunications—and several keying techniques exist (these include phase-shift keying, frequency-shift keying, and amplitude-shift keying). The "Bluetooth" system, for example, uses phase-shift keying to exchange information between various devices. In addition, there are combinations of phase-shift keying and amplitude-shift keying which is called (in the jargon of the field) "quadrature amplitude modulation" (QAM) that are used in high-capacity digital radio communication systems. Modulation can also be used to transmit the information of low-frequency analog signals at higher frequencies. 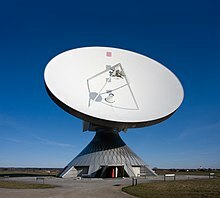 This is helpful because low-frequency analog signals cannot be effectively transmitted over free space. Hence the information from a low-frequency analog signal must be impressed into a higher-frequency signal (known as the "carrier wave") before transmission. There are several different modulation schemes available to achieve this [two of the most basic being amplitude modulation (AM) and frequency modulation (FM)]. An example of this process is a disc jockey's voice being impressed into a 96 MHz carrier wave using frequency modulation (the voice would then be received on a radio as the channel "96 FM"). In addition, modulation has the advantage that it may use frequency division multiplexing (FDM). 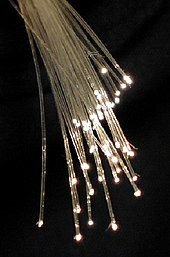 Assisting communication across many modern optic fibre networks is a protocol known as Asynchronous Transfer Mode (ATM). The ATM protocol allows for the side-by-side data transmission mentioned in the second paragraph. It is suitable for public telephone networks because it establishes a pathway for data through the network and associates a traffic contract with that pathway. The traffic contract is essentially an agreement between the client and the network about how the network is to handle the data; if the network cannot meet the conditions of the traffic contract it does not accept the connection. This is important because telephone calls can negotiate a contract so as to guarantee themselves a constant bit rate, something that will ensure a caller's voice is not delayed in parts or cut off completely. 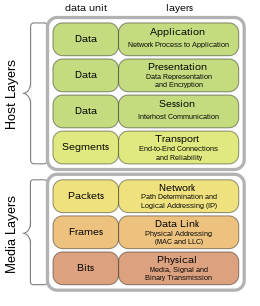 There are competitors to ATM, such as Multiprotocol Label Switching (MPLS), that perform a similar task and are expected to supplant ATM in the future. In digital television broadcasting, there are three competing standards that are likely to be adopted worldwide. These are the ATSC, DVB and ISDB standards; the adoption of these standards thus far is presented in the captioned map. All three standards use MPEG-2 for video compression. ATSC uses Dolby Digital AC-3 for audio compression, ISDB uses Advanced Audio Coding (MPEG-2 Part 7) and DVB has no standard for audio compression but typically uses MPEG-1 Part 3 Layer 2. The choice of modulation also varies between the schemes. In digital audio broadcasting, standards are much more unified with practically all countries choosing to adopt the Digital Audio Broadcasting standard (also known as the Eureka 147 standard). 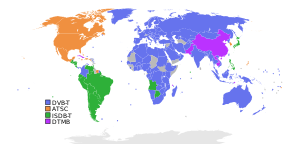 The exception is the United States which has chosen to adopt HD Radio. HD Radio, unlike Eureka 147, is based upon a transmission method known as in-band on-channel transmission that allows digital information to "piggyback" on normal AM or FM analog transmissions. It is estimated that 51% of the information flowing through two-way telecommunications networks in the year 2000 were flowing through the Internet (most of the rest (42%) through the landline telephone). By the year 2007 the Internet clearly dominated and captured 97% of all the information in telecommunication networks (most of the rest (2%) through mobile phones). As of 2008[update], an estimated 21.9% of the world population has access to the Internet with the highest access rates (measured as a percentage of the population) in North America (73.6%), Oceania/Australia (59.5%) and Europe (48.1%). In terms of broadband access, Iceland (26.7%), South Korea (25.4%) and the Netherlands (25.3%) led the world. The effective capacity to exchange information worldwide through two-way telecommunication networks grew from 281 petabytes of (optimally compressed) information in 1986, to 471 petabytes in 1993, to 2.2 (optimally compressed) exabytes in 2000, and to 65 (optimally compressed) exabytes in 2007. This is the informational equivalent of two newspaper pages per person per day in 1986, and six entire newspapers per person per day by 2007. Given this growth, telecommunications play an increasingly important role in the world economy and the global telecommunications industry was about a $4.7 trillion sector in 2012. The service revenue of the global telecommunications industry was estimated to be $1.5 trillion in 2010, corresponding to 2.4% of the world's gross domestic product (GDP). ^ "Chronology: Reuters, from pigeons to multimedia merger" (Web article). Reuters. 2008-02-19. Retrieved 21 February 2008. ^ a b c d Wood, James & Science Museum (Great Britain) "History of international broadcasting". IET 1994, Volume 1, p. 2 of 258 ISBN 0-86341-302-1, 978-0-86341-302-5. Republished by Googlebooks. Accessed 21 July 2009.